Four decades ago Henri Lefebvre anticipated the complete urbanisation of the planet, which no longer sounds so strange. Radical shifts seem to be appearing in the way we situate ourselves within and through the city, like a rupture of scale between self and body, the World and the Earth. The World reaches a point of exhaustion at the very limit of our thinking, even believing in its possibility, just as it rebounds on a feeling of what’s happening to the planet as an embodied entity. O'megaVille is an ongoing process of interdisciplinary collaboration around critical perspectives on planetary urbanism, towards a kind of speculative futurity for embodied praxis within everyday experience. These ideas are mobilised in a series of events, works, workshops and symposia, at the intersections of video, performance, sound, installation, mobile and interactive media. The project peers through the lens of Google Street View, via cross-platform media, to pose the question - how may we come to occupy infra/planetary bodies that are translocal and untimely? How may this occupation occur through an ecology of practices that is political and ecological as much as social and technical? * with Senselab, Concordia University. Single-channel version of a 3-channel video installation at Glasshouse Gallery, New York. With reference to the exhibition theme - Weather Patterns - and work of other artists in the exhibition, Erin Manning and Nathaniel Stern. An old car tyre borrowed from the Motor Repairs workshop across the street becomes a patterned printing device for drawing a small pile of cinnamon across a red street marking (those used as shorthand codes for underlying water utilities). The 3 channels include - cinnamon print (iPhone with olloclip macro-lens ,left); Nexus image sphere video navigation, with local passersby helping to move the tyre around (top-right); iPhone with olloclip macro-lens attached to the tyre as the cinnamon print is made (bottom-right). Channels 1 and 3 were exhibited on iPhone/Nexus4; Channel 2 on Samsung tablet 10.1. A larger process included collective foraging actions on the street, a movement workshop, and group SmartMob Conga Line, aiming to generate a processual weather pattern inside and outside, between the gallery and the street. One of these participatory actions used 10 car tyres, 4 with wireless microphones inside - so that various objects could be heard over the sound system when placed inside - e.g. plastic cups jingling around as the tyres rolled. The GoPro / WiFi tablet mirroring (below), is now being developed as a series of Situationist drifts (dérive) through various cities - as a participatory exploration of planetary urbanism and its orbital movements. Mobile media SmartMob with Alanna Thain, Peter Weibrecht, and myself; a collaboration between Senselab and Topological Media Lab. (Also in post-production: to include Nexus 3D image sphere navigations). We are now combining this technique with object-assemblages in relation to people seen on Google Street View, exploring fluid identities through collective media-performance. 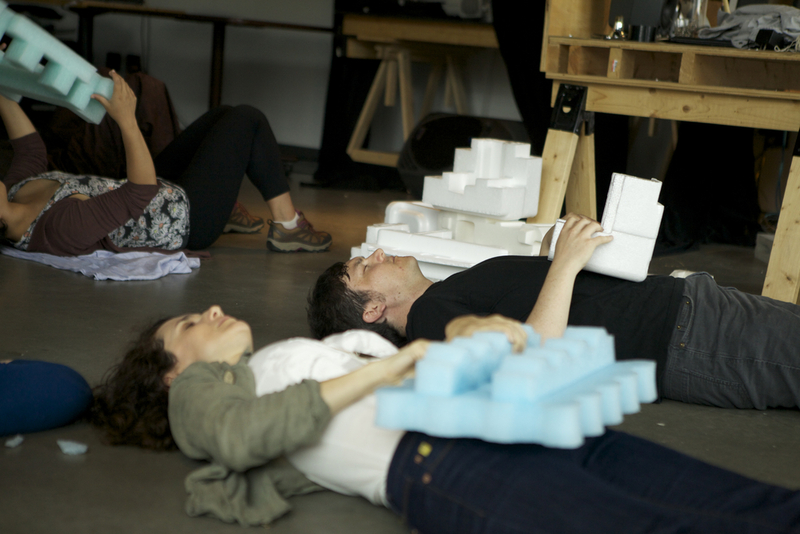 Physical movement improvisation with found objects led by Mayra Morales, following a Deep Listening process by Doug Van Nort; in collaboration with members of Senselab and Topological Media Lab at Concordia University. The use of object-assemblages is now being developed combining mobile media and locative interfaces (Google Street View and Google Cardboard VR). Using found objects from the street for mobile media performance playback - exploring untimely overlays and spatial displacements of sound and video. A collaboration with Alanna Thain, Martin Lan, and dance students at Universidad de las Américas in Mexico. This included mobile media SmartMobs, and performance interventions on the street (video forthcoming) through site-specific reference to Google Street View.